A couple of posts on internet forums about shooting action shots reminded me of shooting sports in high school. Most of my action shots now involve wildlife and for a while I shot equestrian events. Those are all different sorts of action and each requires a slightly different approach to use your gear effectively. But, amidst the talk of high frame rates, electronic flash, autofocus points and modes I started to remember shooting with a 4×5 Crown Graphic film camera. The film was in holders that had to be loaded and unloaded between shots. Oh, and don’t forget to put the dark slide in and take it out and make sure the color code indicated whether it was exposed correctly. To show you what the camera looked like, here is an image from the filmphotographyproject.com. 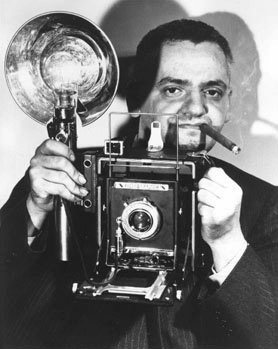 The photographer is Weegee. The flashbulbs were about the size of a 60 watt light bulb. In later years, they were replaced with a Heiland Strobonar which was about as big of a flash unit but also required a wet cell battery carried over one shoulder. The other shoulder was used to carry the film carriers. You could actually shoot 2 or 3 shots a minute with a bit of practice but, if you did that, you got yelled at for wasting film. In order to get the shot, you had to be in the right place, have the flash exposure calculated for some position and then get the shot. Here are a few examples from a long time ago. 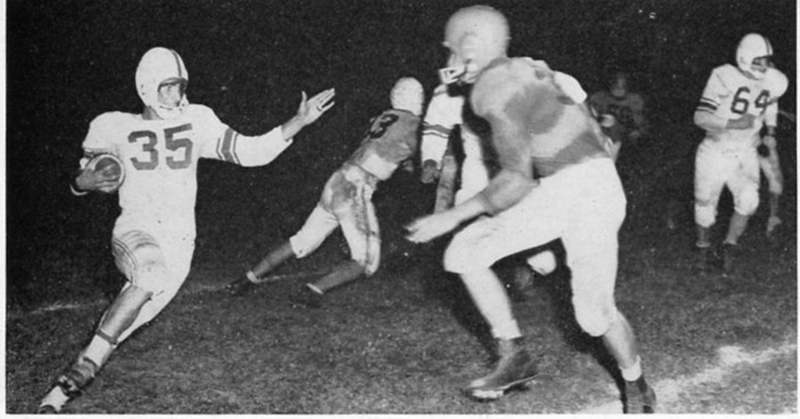 For football, you needed to focus somewhere on the field where you expected the play to go and wait for the action to get there. If they ran the play to the other side, you missed it. No zoom lenses. Exposure? Easy, figure the distance you were going to shoot at and use the guide number for the bulbs you were using. ISO? Oh yeah, it depended on what film was in the folder and how much you wanted to push it in the developer. With basketball, you did pretty much the same. Use the rangefinder to pick a focus point like the basket or one of the foul circle lines. In these, I used the basket. In the first, the layup came from a drive straight down the middle and the player shooting was in focus. In the one on the right, the defender got to the basket before the shooter and the shooter stopped short for a jump shot. Yeah, the main subject is a bit out of focus but, in sports, catching the action is the key and technical issues become secondary. 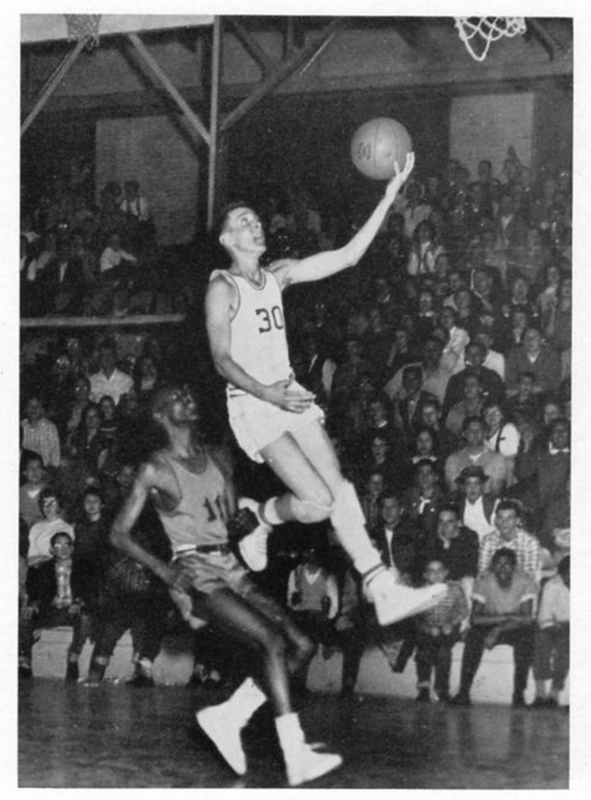 And, for my moment of reflected glory, the coach seated on the right is Chuck Knox. 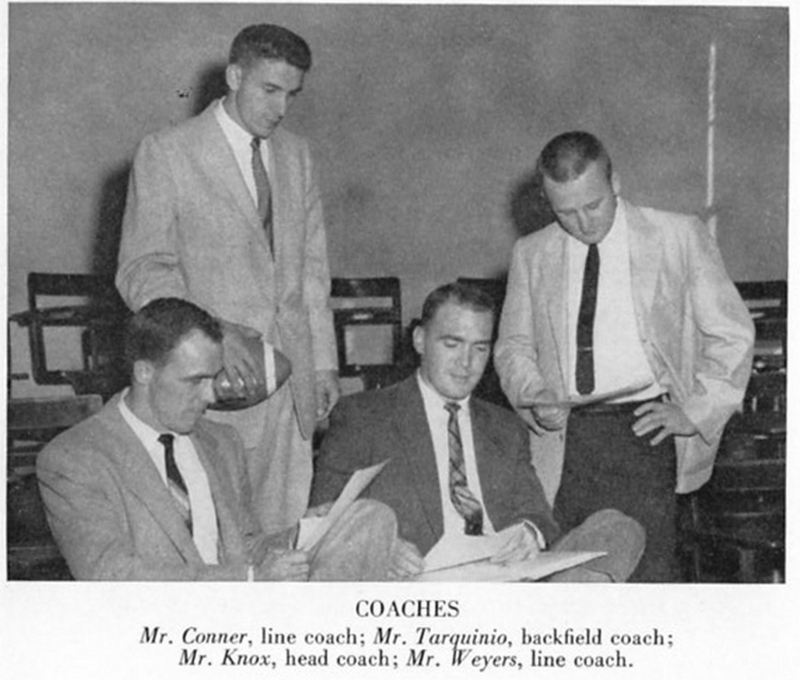 My High School was his first head coaching job. He later went on to coach the Seattle Seahawks in the NFL. I’ll post later about current action shooting issues. This entry was posted in Camera Gear, Photography and tagged action photography, basketball, chuck knox, crown graphic, football, seattle seahawks, sports. Bookmark the permalink.